We empower students for a life of citizenship both in our community and around the globe. Lebanon Valley College Service trip to Puerto Rico. Certainly, service is its own reward. Additionally, LVC provides encouragement by granting three community service awards--bronze, silver, and gold--which may be included in one's personal profile on LVC's Handshake. Let prospective employers know that you are someone who cares about the community! Should you need help planning a community service project, contact Jen Liedtka at liedtka@lvc.edu or 717-867-6167. Finding Opportunities for Community Service at LVC: Redbook, Facebook, and the Agency List. Most service opportunities are included in LVC's activity register, Redbook, available to students via MyLVC. Detailed information regarding upcoming events is also available via our Facebook page under LVC. Click on the "Events" tab within the group fora chronological list of service opportunities with some additional detail. Don't find an opportunity that suits you? Explore the Agency List. 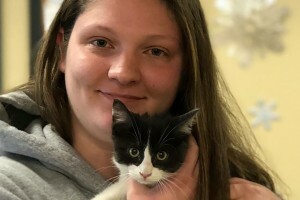 Local service organizations are listed there according to areas of interest (animals, the elderly, healthcare, etc.). I cannot imagine my life without volunteerism, and I hope I never have to. Wherever life takes me, I will help those in need, big or small. 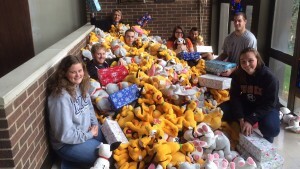 Students pack boxes of stuffed animals for Operation Christmas Child. 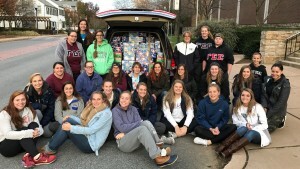 Gamma Sigma Sigma and women's lacrosse packed more than 300 boxes for Operation Christmas Child in November 2017. 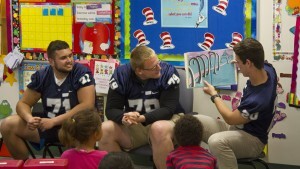 The LVC football team reads to the students of Henry Houck Elementary School in Lebanon, Pa.
Students assemble hygiene kits for victims of recent hurricanes as part of a community service project in October 2017. 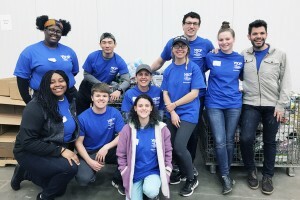 Hurricane relief efforts championed by students with help from new Community Service Coordinator, Jen Leidtka.